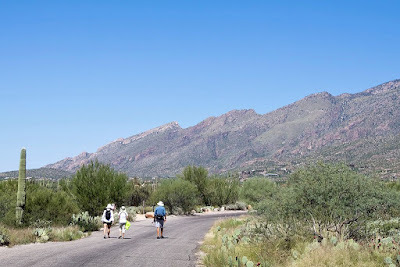 Your Daily Dose of Sabino Canyon: Your comments wanted! It's time again to make a public-service announcement. A draft environmental assessment by the Coronado National Forest presents four alternatives for future operation of the Sabino Canyon shuttles, and members of the public have until Oct. 13 to submit comments on the proposals. Here's the link to the article. And reproduced below are the ways to submit your comments. PLEASE DO NOT SEND THEM TO ME. Please follow the instructions below. 1. Name, address, telephone number and organization represented (if applicable). 2. Title the correspondence: Environmental Assessment for Sabino Canyon Shuttle Authorization. 3. List specific facts, concerns or issues, and supporting reasons why the comments should be considered. And a bonus photo from Ned Harris from 9/10/2016. when you can recognize people from behind!